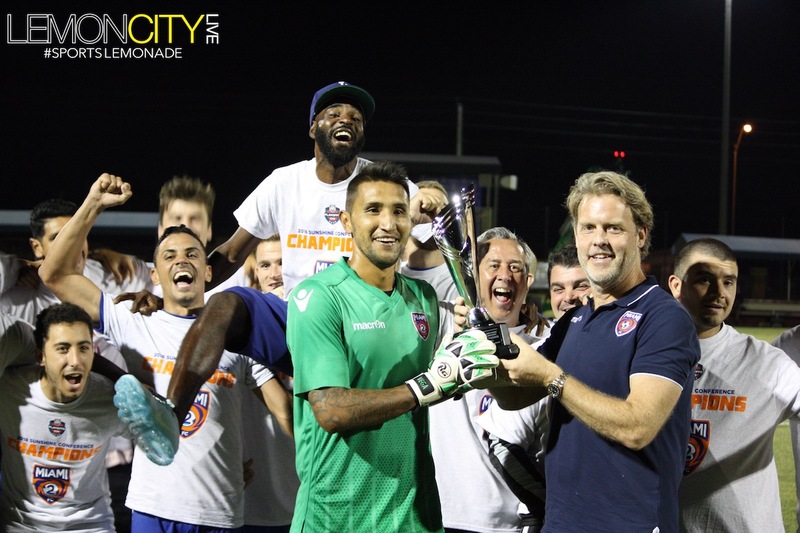 Miami Gardens, FL – The Miami FC is the team that Miami fans want, but do we really deserve them? The team has now won their 3rd championship in three seasons, this time clinching the NPSL Sunshine Conference Championship. This club was built to win, and they’ve done plenty. While Beckham’s group struggles to get their MLS project up and running, the Dolphins struggle to sign good players, and the Marlins refuse to keep any players Miami fans like, Miami FC has shown lasting success by keeping a core group of players together. Last season, the team won both the spring and fall season titles. They fell short of their U.S. Open Cup aspirations, and fell to the Cosmos in the NASL playoffs, but they broke just about every record in doing so. They were historically good, and probably the best team in the country and one point. Even today, while Miami plays in the NPSL, would you be surprised if Miami was able to defeat a team like Orlando City, who just yesterday ended a nine-game losing streak? I think that’s more of an indictment of the American Soccer system, but that’s for another day. Yesterday, the Orange and Blue boys faced a familiar foe in Jacksonville Armada FC. Miami hit the ground running, getting on the scoreboard 1st in the 8th minute. Dylan Mares sent in a pinpoint cross for a Chris Tyrpak header. 1-0. In the 28th minute, Jacksonville struck back, when Miami let a ball get away in their own defensive third. Ciaran Kilduff grabbed the loose ball, dribbled around Daniel Vega, and found the back of the net. Five minutes later, Tyler Polak, from the left wing, crossed it into Darío Suárez in the middfle of the box for a powerful volley, giving Miami their lead once again. 2-1. In the 2nd half, it only took eight minutes for Miami to extend their lead. A counter attack, started by a Rhett Bernstein tackle, and taken by Ariel Martinez, eventually found its way to Tyrpak, and put Miami up 3-1, giving them the game and the championship. Next up, Miami hosts the Atlanta Silverbacks in the South Region Semifinal on Tuesday, July 17.